I don't eat much meat. Usually I don't miss it, but after being sick for a few days, I felt like I could use a protein boost. This Breakfast Panini from Eating Out Loud was the perfect solution. Crispy bread filled with eggs scrambled with scallions, salty bacon, juicy tomatoes and (since I was out of mozzarella) my own addition of creamy goat cheese. Need I say mo re? This sandwich would make a perfect breakfast-on-the-go or a simple late night dinner as well. Be sure to head over to Eating Out Loud for the full recipe. 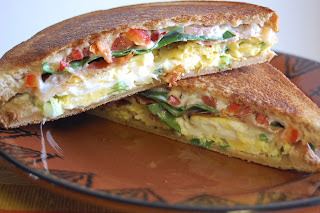 Or check out the last Egg Panini-creation I tried here. You're making me so hungry -- your panini looks incredibly good! Thanks for trying out the recipe -- I'm glad you enjoyed it.